Whether or not there was truth to that story, the legend remains. Perhaps the folks in and around Major League Baseball need a little lesson as well. “Lan” doesn’t mean anything in Spanish. But based on the conversation within baseball circles, you’d think it meant “love” or “respect” or “credit.” As in, the things Rockies third baseman Nolan Arenado is getting none of. “Nolan” does not mean “no love.” And it shouldn’t. And he should be a lock to win a third consecutive Gold Glove. As such, it ought to come as a total shock that Arenado is being roundly disregarded by most national sources as a legitimate MVP candidate. He was not in Sports Illustrated’s top three candidates as late as September. He wasn’t even “in the mix,” according to CBS Sports, on August 27.And per sportsinsights.com, a sports betting analytics site, he’s not even one of the top dozen players with odds to win the award (updated late August). 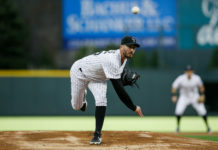 The preferred answer, as it’s always been for players in Colorado, is that Arenado has two things going against him: 1) Playing for a loser, and 2) Playing at Coors Field. But MVP voters (and those pushing other candidates) appear willing to disregard that notion, as Paul Goldschmidt is high atop many of these lists and the Nationals (though above .500) collapsed down the stretch with Bryce Harper at the center of a bizarre incident that illustrated some major fractures in the Washington clubhouse. Joey Votto, SI’s No. 3 candidate, played for the Reds, one of the few teams worse than the Rockies. 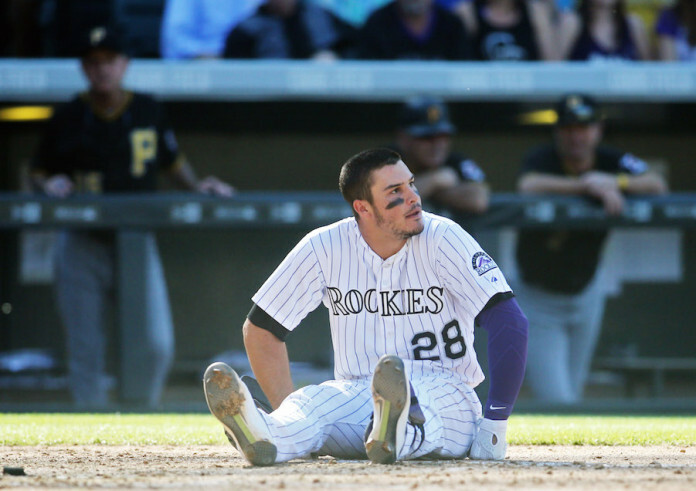 Playing for the woeful Rockies ought to give Arenado additional consideration – not be used as a knock against him. As for playing at Coors Field, Arenado did put up better numbers at home (though not in home runs). He had more doubles, RBI, and hits at Coors Field, but Bryce Harper had a similar split in all those categories. He hit more doubles on the road, but more home runs at Nationals Park. Home cooking is good for every hitter, not just those that play at Coors Field. The real reason Arenado won’t win the NL MVP is because of his batting average. Arenado ended the season hitting .287, good for 20th in the league. Harper, who will likely win the award, hit .330 and finished second behind Miami’s Dee Gordon for the NL batting crown. Goldschmidt, Votto and Buster Posey, among others, all finished the year with .300-plus averages. Only once in the last 25 years has a National League MVP won the award with a sub-.300 batting average. Jimmy Rollins did it in 2007, and then Kevin Mitchell was before him in 1989. (Interestingly, Mitchell was the fourth in a string of four years with sub-.300 winners.) Arenado’s defense should help his cause (as it should Goldschmidt), but it’s simply not enough to make up more than 40 points in batting average. Still, what Arenado did in this just his third full season in the Majors should be getting more attention from the rest of the baseball world. 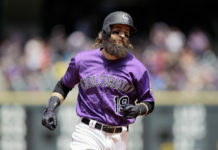 He’s assumed the mantle of franchise leader and developed a great rapport with Carlos Gonzalez that saw a huge resurgence in the lefty throughout the second half of the season. Arenado has an affable personality (cough, Bryce Harper, cough) and he plays the game with both fundamentals and flair. 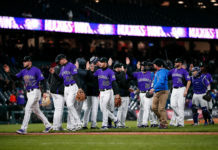 MLB and its mouthpieces may not love the Rocky Mountain high Denver market, the Rockies’ woeful on-field product, or the stigma that hangs over hitters at Coors Field, but they’re missing out on an opportunity to market one of the game’s brightest young stars in Arenado.